One of the distinctive marks of a Coptic Christian is the cross tattoo worn on the wrist. Sometimes applied as early as forty days after birth (and following baptism), the tattoo is a permanent identification marker signaling to all the faith and community belonging of the bearer. 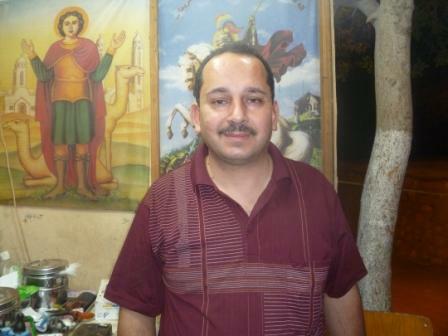 Girgis Ghobrial is an electrical engineer by training and a tattooist by passion. For over twenty-three years he had made a ministry of applying the tattoo to the wrists of Copts. 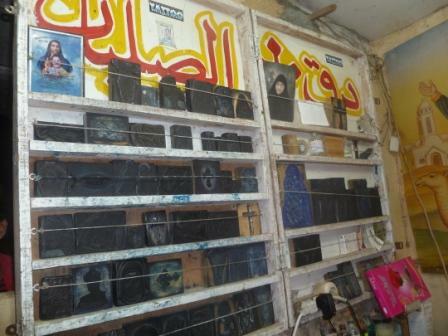 This is his shop at the St. Simon Monastery in the Muqattam Mountains east of Cairo. The location deserves its own description, but in short it is the recently developed church complex dedicated to serving the poor of ‘Garbage City’. 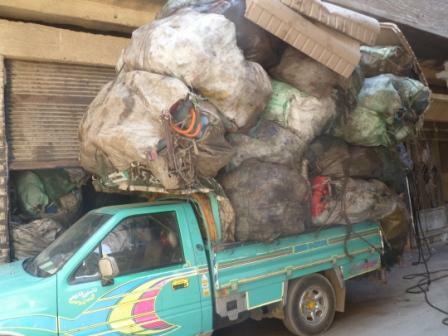 This community of Coptic Christians has long been the trash collectors of Cairo, recycling over 90% of collected waste. Ghobrial contributes to the ministry with his skills and time. He is present at the monastery every Friday and Sunday for services, charging around $4 US for a cross tattoo and $25 US for a more elaborate tattoo, such as in the picture below. All proceeds are donated to the monastery, and if a customer is unable to pay, he offers his trade at reduced prices or for free. Ghobrial made certain to emphasize the cleanliness of his operation. Every needle is replaced for each new job. 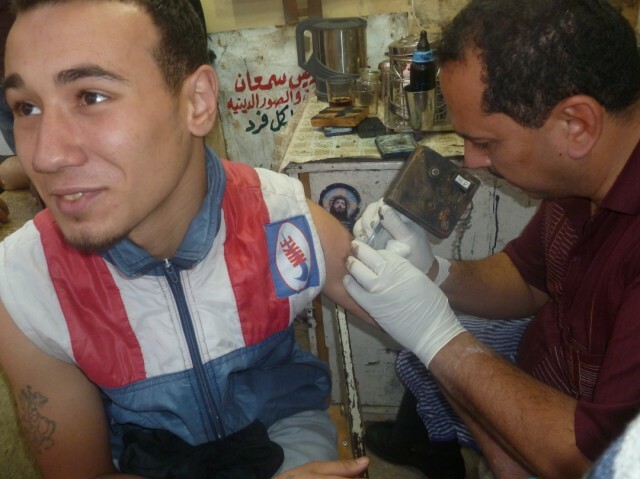 Mina, with the cross tattooed on his arm in the picture above, said the operation does not hurt very much. As for motivation, he was getting the same image a friend of his bears. Many of the area youth were milling around the booth. Tattoos, they say, are just a part of the local culture, usually among youths in poorer areas. Most of their friends chose to do so, and they imitate. Being Christians, however, their choices tend to be crosses or images of the saints. Local priests, they report, do not provide any special encouragement for or against tattoos, even the common one on the wrist. The tattoo booth, however, signals an official acceptance of the practice, and its location is right before the entryways to the two main churches – both in caves in the mountains – which seat tens of thousands of worshippers each. Nor shall a garment of mixed linen and wool come upon you. In the New Testament, I Corinthians 6:19 declares the body to be a temple of the Holy Spirit, without any reference to tattoos but with the designation the body belongs to God and is meant for his honor. Does a tattoo of any nature honor God? 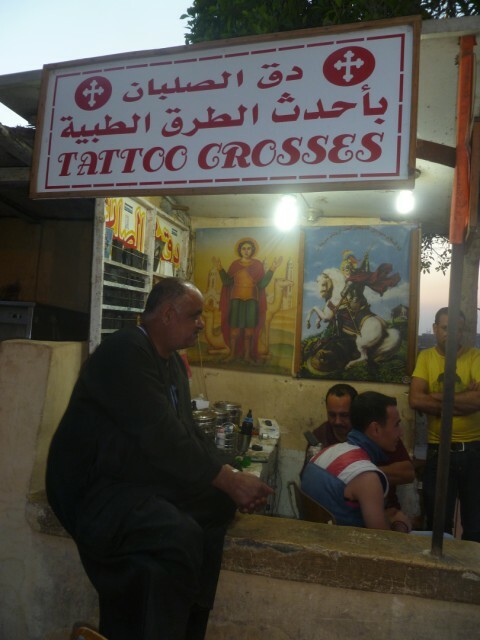 Do the tattoos of these Coptic Christians? Surely this verse is neither command nor outright license for Christians to get tattoos, but it does put the matter somewhat in perspective. If God signals his love for his people through the image of a tattoo, perhaps the Copts’ love for God displayed on their wrists is equally acceptable. All the same, I don’t like it very much. Why do something you can never get rid of? Hmmm, but is that not also the demand, result, and promise of faith? Perhaps a tattoo of faith is easier, but its glory is far less. Either way, let its mark be a choice made in freedom. 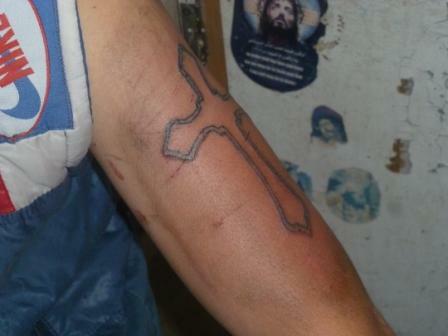 Jason–it is my understanding from conversations with Copts here in the U.S. that the cross tattoo applied to the wrist in infancy is a permanent mark for the purpose of being able to identify Coptic children who may be kidnapped from their families and given/sold into Muslim families so as to be raised Muslim. It is a mark of protection and identification, not something done for the fun of it. I believe this sheds a different light on the practice, and takes it out of the realm of the generic debate about tattoos on Christians. Yes, absolutely. Perhaps the article can be read as more lighthearted than desired. This is likely due to the fact that I witnessed what was a choice-tattoo, albeit in a Christian manner. Absolutely the wrist tattoo is about identification and community, though I would want to be hesitant about protection. Their testimony about kidnapping is far more important than mine, but while I often hear the fear of such kidnapping, I haven’t heard it tied to the tattoo yet. This gives me something more to inquire about! But as for the overall point, it is to help make what might be an odd practice more familiar and acceptable to the average Westerner. It certainly isn’t a full-on treatment of the tattoo and all it stands for. This is worthy, and I’ll certainly write as I learn more. Hi Jason! I didn’t mean to imply your commentary on the subject of tattoos there to be light-hearted. Rather, I believe it has more significant meaning to the Copts in light of constant persecution as they live among Muslims. The wrist cross is a community identifier, but simultaneously it allow the community to identify their own in time where they have few religious protections. This, of course, has little to do with decorative religious tattoos acquired in adulthood as far as I know. Of course, I can only relay what others have told me. I am neither a Copt, nor live in Egypt. However, I do know that their community is shrinking drastically, and stories of children kidnapped to be raised in Islam are heart-breakingly true. It is put on the wrist as protection against kidnapping. Because you can not cut off a tattoo that is on your wrist or you would die. A tattoo somewhere less lethal can be removed. Thanks. Do you have any idea when this practice was started, and under whose leadership? That is, did it arise spontaneously from the people or did the church help direct the practice? Although Muslim conquest of Egypt took place in 639 AD it was under Fatimid caliph Al-Hakim bi-Amr Allah (reigned AD 996–1021) that the persecution of the Copts became severe.So the practice started sometime during this reign as the Coptic Christians were prevented from wearing crosses or declaring themselves Christians. As the persecution increased, Christians started to tattoo the cross on their skin as a sign that they will never denounce their Christianity till they are skinned and no the church nor the Pope and Patriarch of Alexandria directed the practice.You are not ordered to get a cross tattooed. Personally i never got one till i was 15 visiting a monastery in Egypt maybe only because i was not born in Egypt but it has just become a cultural norm to do so with deep meaning,history and faith. it actually originated during the roman rule, they marked christans with tattoo’s. the muslims continued (or restarted this practice) when they occupied Egypt. 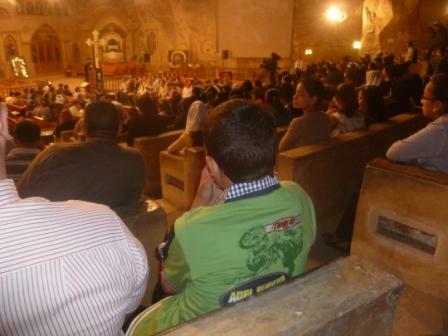 Coptic Christians wear this with pride, and share this with their (coptic) children. Yes it might aswell help with the kidnapping mentioned in other comments, but it is not the reason. Kind advice: don’t write misinformed articles like these, inform yourself first, and do it well. Appreciate your thoughts and polite advice, Joha. Thanks. This was written with very poor understanding of the history and development of the practice. Speaking as an American Eastern Orthodox, you should be cautious of too quickly embracing Protestant misinterpretations of Scripture (especially Jewish ceremonial law) and forcing it willy-nilly across the board on other cultures. As someone stated above, Coptic wrist tattoos stem from the Muslim practice of enforced tattooing of the wrists of Christians so they could be identified. Think Nazi Germany tattooing serial numbers on Jews and forcing them to wear yellow Star of Davids on their clothing as part of the Jewish holocaust – same basic thing with the Coptic persecution which has gone on for over a millennium. The Copts took this practice which they could not avoid – which was a portion of their persecution for Christ – and turned it around within their own culture. Rather than the Cross tattoo being a mark of shame, they turned it around into a mark of glory and willingly embraced it (Romans 1:16), tattooing even their children after baptism, a circumcision of ink to identify them as belonging to Christ. To the best of my knowledge, the Muslim practice of forcing the tattoos died off in large part because the Copts beat them to it – the Copts chose to be identified with Christ, even though it could very well lead to their death. Those that can afford it get ornate tattoos in a display of love for Christ. It is no longer enforced by the Muslims, nor is it required by the Coptic Orthodox; it is embraced as a culturally-ingrained refusal to sacrifice the incense of anonymity to the idol of Caesar. To learn a little more about the Orthodox faith, which is the ancient faith of the Holy Land , grown up but otherwise virtually unchanged since Christ initiated the one, holy, catholic and apostolic Church, watch the following: https://www.youtube.com/watch?v=YimgCkBbH7c&list=PLxcntdlvObPgDGgBg1mYsUxnfGcyTBKcc. This is given from an Eastern Orthodox perspective. Note that (at least relative to the Western Roman Catholic/Protestant denominations), there is very little different between Eastern and Oriental Orthodox beliefs and practices. Our OE and OO theologians generally agree that our disagreement regarding the understanding of Christ’s divinity and humanity is not a disagreement of substance but of definition. We are not denominations, as Orthodoxy is pre-denominational.